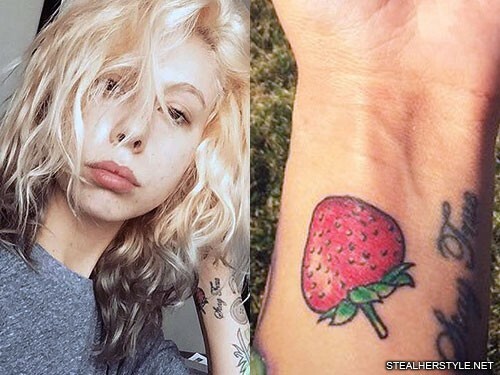 Lil Debbie returned to artist Rebecca Sophia to have more flowers added to the back of her left hand in March 2016. 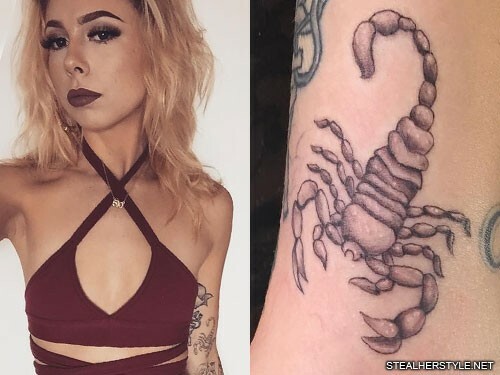 Lil Debbie has a tattoo of a scorpion on her left upper arm which she got from artist Rebecca Sophia in July 2015. 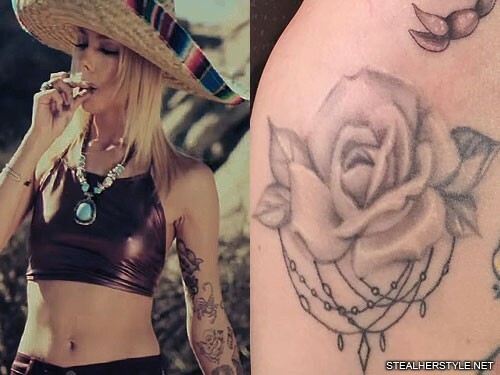 Lil Debbie got this tattoo of a grayscale rose with jewelry chains from artist Rebecca Sophia in May 2015. 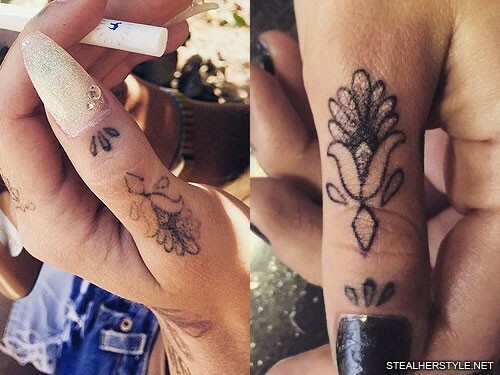 Lil Debbie added to her hand tattoos with this little design on her left thumb from Rebecca Sophia in January 2015. 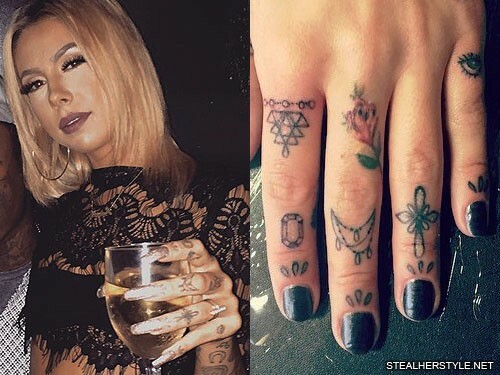 Lil Debbie has an almost complete set of knuckle tattoos on her left hand. On her index finger is a row of circles or beads, a triangular geometric design which covers her faded pink woman symbol tattoo, and an emerald-cut jewel. 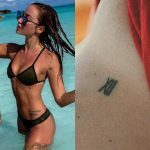 On her middle finger a flower covers her faded yellow lightning bolt tattoo and her other knuckle has a beaded jewelry design. On her ring finger is a budded cross and on her pinkie is an eye. Five of the tattoos were done in one session in November 2014, while the jewel and the row of circles were added in January 2015. 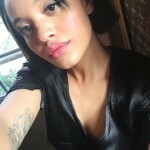 All were done by Rebecca Sophia. 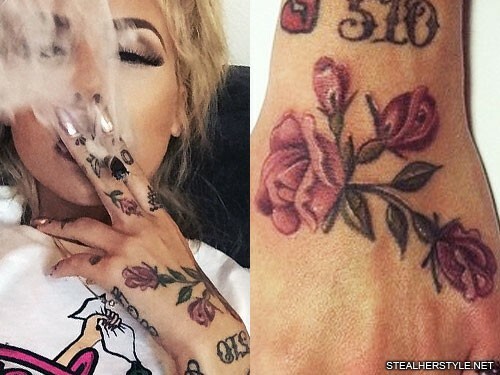 Lil Debbie got this tattoo of flowers and leaves on the back of her left hand in November 2014 from Rebecca Sophia. 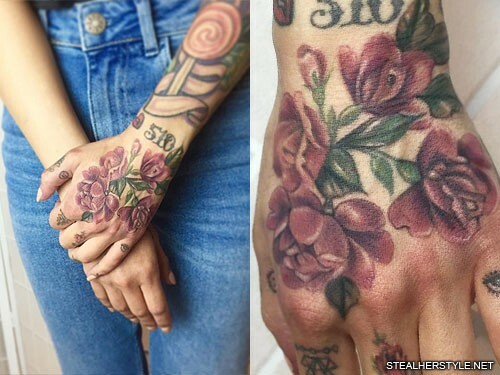 She returned to the same artist to have more flowers added, filling in the entire back of her hand. 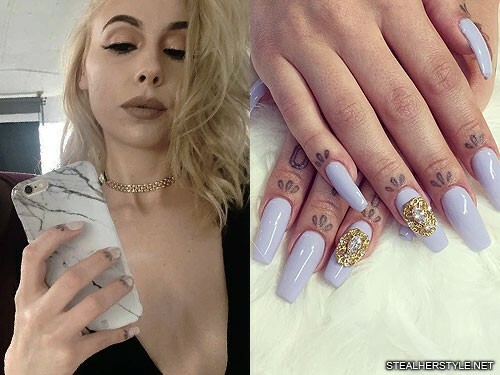 Lil Debbie has these little designs below her nail beds on all of her fingers. The trios of teardrop shapes look like petals or leaves. 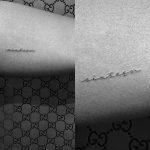 She had them done by Rebecca Sophia in November 2014 in same session as a bunch of other hand tattoos. 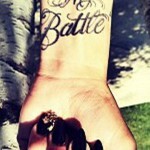 While her left hand is covered in ink, her right hand is relatively bare. 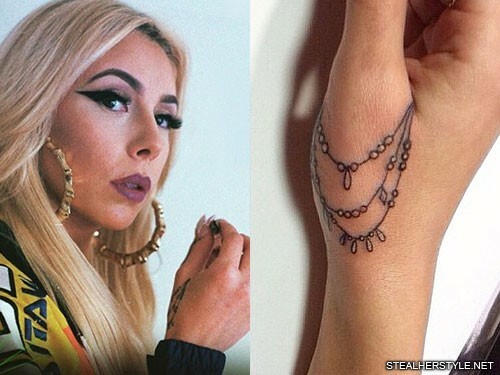 Lil Debbie got this tattoo on her right hand from Rebecca Sophia in November 2014. It is a jewelry-style design of three strands of beads.